Just recently my husband and I discovered that the church we had been attending for the last year is Calvinistic. We has no idea and were incredibly surprised and upset by this discovery. Nowhere on the churches constitution does it mention Calvinism, TULIP or any of it's other deceptive descriptions..."Doctrines of Grace"...etc) It would seem that the Bible is right, when it points out that false teachers do seek to "privily" deceive us. "Closet-Calvinism" is everywhere! On the last day we attended service there, my husband and I near about died, when the pastor told us he was going to preach on the first point of Calvinism. At that stage we didn't know a lot about Calvin's theology, but we were already alarmed by what we did know. On the way home we discussed this topic together, and made a decision to research it thoroughly; which we did over the next two weeks. We read the Bible passages that Calvinists claim "prove" their theology, and ones that completely refute, it in context, over and over. We also read other articles online and watched sermons on this topic, then we checked and re-checked everything we read/heard back with the Bible. Needless to say, my husband decided that we would not be returning to a church that preaches false doctrine. It can be hard as relatively new believers, to navigate our way through all of man's false teachings, but we feel that when we take a teaching and examine it next to the Bible...God's word makes light work of sorting out who the wolves are! We are so thankful for it! Our family have now found a new church to attend! We are thankful to have found another so quickly, and hope that we will gain instruction, knowledge, enjoy fellowship and win people to Christ. God truly has been directing our steps in this area, and we feel sure that we are where He wants us to be. Shalom and thanks for this post. I studied with a group of Calvinist for maybe two months and was amazed....amazed at the contortions/doctrinal gymnastics that was going on to substantiate the positions held. I must say, the leader of the study would quote entire chapters from memory to dazzle all present. I often thought to myself, what good is there to memorize the Scriptures, but fail to understand Their import. So, yes, I can identify with this. Anyway....Shalom In Yahshua to you and yours.....and have a blessed week. So sorry you had to leave your church. Well, SO GLAG you DID, but sorry that they were teaching false doctrine! It is So HARD to find a good church (from what I hear) I am sooo thankful for a great work going on in the state of Maine....we have had 4 men sent out of our home church, starting new churches right in Maine. We have many others going out soon. I LOVE the vision here, and what God is doing. It's unheard of in so many places today. My pastor always says, "everyone judges a church by how many people it brings in, but it's really and truly about how many people it is sending out". It's true, we need to be raising up preachers and sending them out (the 1st century way)! Well, I am so pleased to be a part of what God is doing in Maine! It's exciting, uplifting, there is so much JOY in it! I will be praying that your new church is doctrinally sound and based on God's Word! Praying for your family :) Have a GREAT week!!!! I am glad you found you a new church. It is sad that people think they are ok. When we were looking for a church we went to one that was like that. We are Freewill Baptist so we believe you can lose your salvation. I do believe God wants to save people and he died for everyone, but you have to ask him to forgive you and change your life. I have a neighbor who said he was saved and baptized when he was 10. But he said he is not a christian now and does not go to church or live right, But he still believes he will go to Heaven when he dies. I do not believe that is true. Just God does love everyone but not everyone loves God. Thats why the Bible also says "Strait is the way and few there be that find it. I believe we believe the same way. I hope you have understood my ramblings. Its hard to explain in a comment. God loves everyone but he is a just God and Hell is a real place too. Its hard to think that people think they are ok.
Yuri ~ Sad to hear that you also have experienced this false doctrine. Thanks for your comment. Nicole ~ I wish there were more Bible believing churches here in Ireland...there are extremely few! Catholicism still has a choke hold on the majority of Irish people. Chelle ~ We do believe in free will also, as the Bible teaches; but this to us simply means that man has the free will to either choose to believe on Christ or reject Him. We do not believe you can lose your salvation. This caused us a few tense conversations with members of our old church, who INSISTED that if we were not Calvinists then we MUST be Armenian (which they stated meant you can lose salvation)...we are not either, and do not believe the Bible teaches either of these things. Lots of great faithful men in the Bible displeased God at one time or another, and we believe the Bible is clear that these men were still saved and went to heaven. One can certainly become backslidden (but nevertheless saved) however to a greater or lesser extent. We believe that too. We have had many in our church who came out of fellowship with God and reclaimed salvation. So maybe you misunderstood what I meant. I have had times in my life where I haven't always pleased God either but he kept me. I do not argue anything that is said. Even if we did believe a little different doesnt make me upset a you or change that I consider you a friend even though i've never met you. I have friends who are even stricter than me and i do not argue with them about what they believe. I live peaceably with them. So don't ever think you would hurt me. I love you as a sister in Christ.I also think you do a wonderful job raising your children.You have inspired me many times. Just out of interest, do you think that Calvinists are not true christians? We would hold to some of Calvin's doctrine, but we have dear christian friends who wouldn't. I can see why you would rather attend a church that teaches things in line with your own view, but it doesn't mean those who disagree aren't christians. Which parts of Calvinism do you disagree with - so do you disagree with the grace alone by faith alone aspects? Rachel ~ We simply believe the Bible. My husband and I read many of Calvin's own words in regards to TULIP and find all of them contrary to what the Bible teaches. I think many Calvinists are unaware of what this man actually stated in his own words; for example the fifth point often gets put forward as "eternal security" (which is biblical) but in Calvin's own words he never states this...but he does say that one must "persevere" until the end. The Bible does not teach that we must persevere to be saved, but rather that we are "preserved" in Christ. It goes without saying that salvation is by grace through faith. This is reiterated many times throughout the Bible. Calvin's own words again disagree with what the Bible teaches; Calvin teaches that is by faith that a man is saved BUT ONLY if he has been predestined to do so. We do not believe that this is the same thing. While I do disagree with Calvin's doctrines, I do not wish to condemn other believers as "not real Christians". I would however, encourage everyone to study the Bible, pray and seek God's direction on this topic. Predestination is a tricky one, I admit. I've been reading recently about Molinsim - the idea that God is all knowing and included in this foreknowledge, knows what we would do in any given circumstance - so he orders our circumstances so that we freely chose him. I'm still not 100% sure of my views in this area. On the one hand I feel that if God doesn't predestine, then it limits his sovereignty, and the Bible does talk about individuals being predestined from before the foundation of world. On the other hand, there are certainly verses that seem to point to man having free will. Re. perseverance of the saints - I think most modern day "Calvinists", as you say, would interpret that as eternal security - and I would agree with that. Rachel, I've been following this comment thread and just wanted to give you a few thoughts on the questions you are working through. 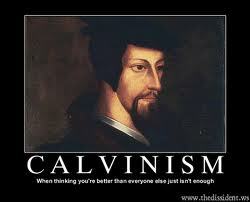 And, just to add a disclaimer..I am a Calvinist. I do believe that predestination and free will can be reconciled. While we have been created with a free will, we were also created with a sin nature. Even though we can freely exercise that will, the truth is, that because of our sin nature, we would never choose Christ apart from the Holy Spirit moving on our hearts to do so-which is where predestination comes in. Christ has chosen a people for himself and will see to it that those people come to Him by revealing Himself and their sin to their hearts. I hope that helps a little bit. Rachel ~ Yes, John Calvin certainly was a wicked man. I don't normally use the word "sovereignty" as it does not appear in the Bible, but we feel that allowing us to freely choose Him does not "lessen" God at all. In my opinion, Calvinism creates confusion and questions for the believer, that simply would not be an issue, if one only followed Bible teachings. I would hope that a person would only look to the Bible to lead them doctrinally, not man. Anon ~ While I understand that you wished to take the time to explain your own thoughts on free will/predestination, I have to admit it caused me concern that you did not appear to have derived this from the Bible. We should be very careful of offering "help" to other believers, if the advice we are giving is not found in the Bible and is simply our own opinion on how the two MAY fit together. Although I'm sure that you only wished to be helpful to a sister in Christ; trying to make something fit with (no scriptural evidence) in order to make it palatable to ourselves and others is a dangerous practice. I considered your points however, and have the following to return: If in our human minds it is possible to reconcile free will with predestination by the process you described, we are once again back with TULIP/Calvinism: man being unable to choose to believe on Christ because of his total inability. This does not explain nor reconcile free will (as described in the Bible) with Calvins theology. Once again I would advise all concerned, to read your own King James Bibles. If someone has to go blue in the face trying to convince you of something that doesn't stand up to the Bible, then it is false, and we should no longer allow ourselves to be railroaded and led astray. Sarah, thank you for your gracious response. You are correct that my intentions were to sincerely offer my perspective to a fellow believer. You are also correct in that I should have offered that response based on Scripture, which I failed to do. In that vein, I would just add that Romans 3:10-12 is a good scripture for showing that our will is limited by our sinfulness. Especially vs. 11- "There is none that understandeth, there is none that seeketh after God.". Any desire in our hearts to seek salvation is because God put it there. A sinner will always choose sin. If we had the ability or the free will that you have described to choose Christ apart from his moving on our hearts would make our salvation dependent on a work. The work or act of us exercising our will to choose Him. To argue against a doctrine because specific words like "sovereignty" is weak at best. The word Trinity doesn't appear in the Bible nor is the word Rapture. Anon ~ My dislike for using the word "sovereignty" has NO bearing on the fact that John Calvin's theology is unbiblical. I simply stated that I dislike using the word, as it does not appear in the Bible. Furthermore use of this word can be confusing to some, as many people associate it with Calvinism; something I would seek to distance myself from. I believe the scriptures you referenced are out of context, and are attempts to prove "totally inability" of man to choose to believe on Christ...something that is not backed up in the Bible. Believing on Christ is not works salvation. As a Calvinist I believe that non-Calvinists have a very limited and simplistic view of God. After all God is the hightest and most intelligent being that exists, when He communicates with us that can be seen as a parent that uses baby talk to explain things to a child, otherwise we would not be able to understand it. Calvinism is for people who embrace ALL of the bible, even the complicated and awkward parts, the parts that make some of us squirm. Adam and Eve were the only humans who had perfectly free will, since the world was untouched by sin at the time. After the fall the bible makes clear that Satan became the ruler of the world and that humanity is in slavery to him unless they get freed by Jesus Christ. When we get saved Jesus buys us literally from Satan with his own blood. The bible contains very abstract concepts and perhaps not everyone is able to grasp them, this is why so many simplify and humanify their believes instead of embracing God in all of His wonderous and frightening glory. Calvinists are brave enough to do so while the rest of the world rather tries to subdue God to their own idolatrous liking. I know you listen to Pastor Anderson, I have heard many of his sermons too, but he has a tendency to shy away from too abstract things. He also engages in eisegesis, which means he reads a lot of stuff into the biblical texts that is simply not there. Preachers are told to preach the WORD (by using exegesis), not their own ideas. From what I understand you are not in the faith very long, so I hope that one day you come to appreciate Calvin. Also a lot of lies are being spread about this godly men, I have once listened to a course about Calvin where complete letters he wrote have been read and no, he was not a cruel man at all. Lots of deception in the world, but then, what else to expect from the end times. I would hope that Calvinism would be "everywhere" as it was the teaching of every Protestant Reformer in history. It still is. The doctrine of free will is a product of the Roman Catholic Church and has been spread throughout Protestant churches in the United States. This has been coupled with the Protestant departure from the King James Bible. A New Name In Heaven! Reams Of Ribbons - Giveaway Results!